I couldn't believe my eyes, when I won the Directors Cuts DVD of Extreme Music on ebay for as much as 0.99 pounds, which is about $1.50! Today I found a used copy of the 1998 Sony expanded release of Star Trek: The Motion Picture at a New England Comics for $9.99. The discs were in pristine condition, too. Today I saw (but I already have) the original Last of the Mohicans and El Cid/Ben Hur/King of Kings for $7 each used. I thought these were somewhat rare, but checking eBay and Amazon, there seems to be a bunch. Also found all three Ryko Bond CDs; I already have the two Barrys but might go back for Conti. 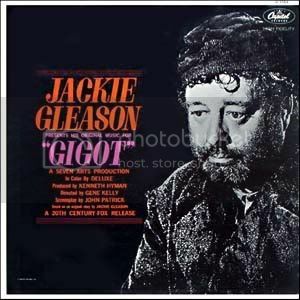 Found a stereo vinyl copy of "Gigot" at a junkstore for 50 cents US currency. I've owned a mono pressing for years. The stereo was in a box of junkstore junk. As usual I felt a duty to rescue this piece of vinyl. Picked up a FOR YOUR CONSIDERATION promo copy of Wall-E this week. And when you exchange that for a cup of coffee, be sure to ask for sugar. What you have is hardly valuable. Around 1980, I found a bargain bin used copy of Goldsmith's STAR TREK THE MOTION PICTURE for $7.95. Out on the street, when I opened it up, I discovered that it had been signed by Gene Roddenberry and the entire cast. Last month I found a "Used" CD of Goldsmith's LEVIATHAN at FYE for only $8. It was re-sealed and had Used stickers on both sides of the jewel case, but the silver dogbone sticker was intact, so actually it was brand new! I said "Sweet!" out loud and got some strange looks. Two months before that, I found AMERICAN ANTHEM by Silvestri and Various at the same store, also for $8 - actually less because they had buy 3 get the 4th free. It's probably one of the earliest-made CDs I own now, printed in Japan in 1986. Re: LeHah - I broke the bank at the thunderous amount of $8.99! Ha! Thats a hell of a find. I've never seen the movie or heard the score myself, but good on you for finding it! I think my favorite find was in the early nineties, I picked up The Whales of August for $8 somewhere on Newbury St. in Boston. If only I could part with stuff; it seems to go for a pretty penny these days. This reminds me of the hardcover book 'Did They Mention the Music?' by Henry Mancini that I bought used through Amazon last year for $7.40. When I opened it I looked at Mancini's original autograph on the first blank page! Especially as a lot of them don't even have bar codes on them (FSM is the only online soundtrack label that does, and they didn't start doing them until 2004 or so). When I used to sell used soundtracks at f.y.e., they usually didn't take ones without bar codes, or ones with hole-punches through the UPC. Intrada and La La Land also have Barcodes - But Varese CD Club does not have. but mostly it is Titanic and song albums that are aivalable where i live in those used stores. As a matter of fact, I also had an identical Amazon experience when I received an autographed copy of "Music by Walter Scharf." Sometimes you collect things not for their value but for the fun of collecting. A fellow soundtrack collector friend of mine makes fun of me when I get excited about finding FYC song CDs. It's just the fun of finding them. I wouldn't pay more than $2 for a song CD, but if it's cheap enough, it goes in my collection. Someone just dumped this past year's FYC CD at my local Salvation Army. Avatar, Up and Hurt Locker (all with unreleased tracks), Shelock Holmes and the song from Crazy Heart. Dollar each. These seem to be the ones sent to everyone after the nominations. Were there any other sent to the entire Academy that I should look out for? Interested in a trade for UP, by any chance? About a month or 2 ago, I got a brand new copy of Never So Few/7 Women for $3.30... on Ebay, of all places! And it was auction, not buy it now.